1.6 How to Apply for Agriculture Jobs in Telangana 2017 @ tspsc.gov.in? Latest TSPSC AEO Notification 2017: Telangana Public Service Commission issued the notification for the recruitment of 851 Agriculture Extension Officers posts. Aspirants who are looking for Govt Jobs in Telangana can grab this opportunity & check the details. Interested and eligible candidates can apply for TSPSC 851 Agriculture Extension Officer Recruitment 2017 through online mode before the deadline. Latest Update on 11/10/2017: The Telangana State Public Service Commission has released the TSPSC AEO Notification 2017 for filling 851 Vacancies. Job seekers can check eligibility candidates and apply online for 851 Agriculture Jobs in Telangana from 13/10/2017 to 31/10/2017. Know further details of the TS Agriculture Extension Officers Notification from the below sections. 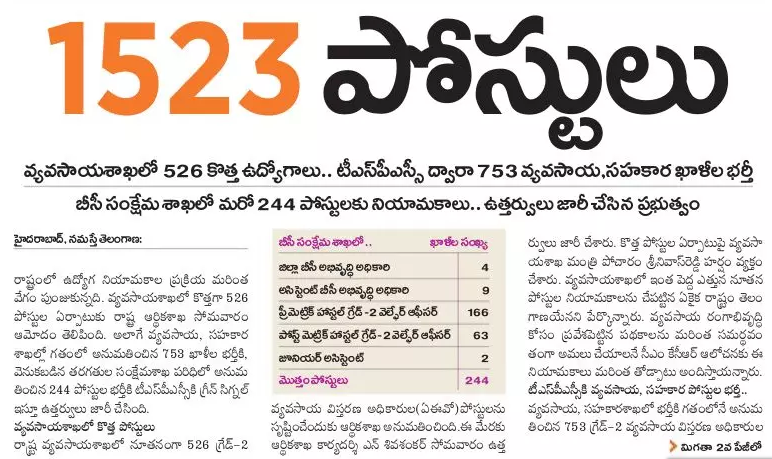 Job hunters who are eagerly waiting for Telangana Govt Jobs are on the right page. Telangana Public Service Commission is going to release TSPSC AEO Recruitment 2017 Notification to fill 851 vacancies of Agriculture Extension Officer posts in various districts of Telangana. Candidates who are in search for Government jobs in Telangana can utilize this wonderful opportunity and check the Telangana AEO Notification 2017 details carefully. The officials will also invite the interested candidates to apply through online. Eligible candidates can go through online to apply for 851 tspsc.gov.in Agriculture Extension Officer Jobs before the last date. Aspirants who have completed a degree in Bachelor of Science in Agriculture will meet the minimum eligibility criteria for TSPSC AEO Jobs. The age limit must be in between 18-44 years. Aspirants can also get the further details of TS Agriculture Department Recruitment 2017 details such as how to apply, selection process, age limit, pay scale, etc on this page. Latest TSPSC Notifications: The newly formed Telangana is providing various job opportunities for young, dynamic & talented candidates. Telangana Public Service Commission will soon issue the TSPSC Notification 2017 for the recruitment of 1523 AEO & BC Welfare Officer Dept Jobs. Under this notification, the officials are going to fill 851 Agriculture Extension Officer Posts. So, candidates who wish to get Government Jobs in Telangana can utilize this chance & go through the TSPSC AEO Recruitment 2017 details carefully through this site. Candidates have to fulfil the following eligibility conditions such as educational qualification, age limit, etc before going to apply for Telangana AEO Posts. Candidates must have passed a Degree in Bachelor of Science in Agriculture (4 & 3 years course), B.Sc Dry Land Agriculture (Vocational) or Diploma in Agriculture Polytechnic (Seed Technology/Plant Protection/Organic Farming) from any recognized board. Age relaxation is applicable to the reserved candidates as per the rules & regulation of TSPSC. Aspirants who have met the above eligibility criteria can check the complete details such as application fee, salary, etc of TSPSC AEO Notification 2017 through the below sections. SC/ST/PWD/Unemployed aspirants are exempted from the payment of the application fee. Applicants have to pay the application fee through SBI ePay only. Applicants are selected for TSPSC Assistant Agriculture Extension Officer Posts on the basis of written exam. The final selection is made on the basis of the marks secured in objective type exam (online/OMR based). Qualified candidates will get a salary of Rs. 22, 460 – 66, 330/- per month. How to Apply for Agriculture Jobs in Telangana 2017 @ tspsc.gov.in? Before going to apply through online, applicants have to register themselves in as per OTR (One-time Registration) through the official website of TSPSC. Visit the official portal of TSPSC i.e, tspsc.gov.in or click on the direct link attached below. You will redirect to the homepage of the official website. Candidates who have already registered can apply by login to their profile through ID and date of birth as provided in OTR. 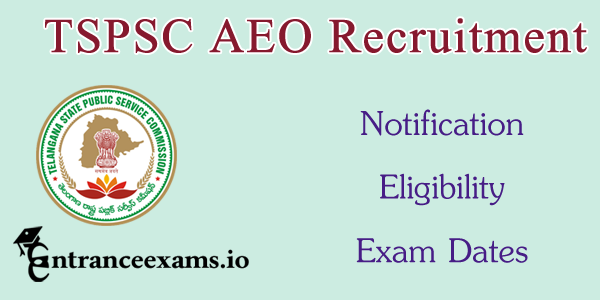 Search for the related link “TSPSC AEO Notification 2017”. Then, click on TSPSC AEO Online Application form download link. Enter all the personal & academic details in the online application carefully. Check all the details before submitting the application form. After the submission of the application form, take the printout of it for future reference. The TSPSC 851 Agriculture Extension Officer Recruitment 2017 details are covered here only for the convenience purpose of the aspirants. Also, our team will update the further details of the exam such as exam date, the issue of admit card, etc soon after the official release. So, we suggest the aspirants stay tuned to our page entranceexams.io for Upcoming TSPSC Jobs.